A planning application is now active. Please submit any response before next Wednesday (5 Dec 2018). The application is pretty much the same as the proposal on which we reported some weeks ago (below). There has been a (claimed) thorough study into the implications for motor traffic volumes of building a huge new multi-story car park in the middle of the city. Yet one conclusion of this (thorough) study is that a new city-centre car park will reduce traffic and pollution in our city. Yes, really! You are invited to submit any comments on the planning application here. 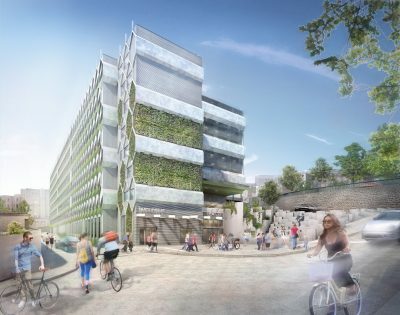 The owners of the Bristol Royal Infirmary hospital in central Bristol are proposing to build an eight storey car park on the hillside next to the hospital. They describe it here as a “transport hub”. On this map the car park is where it says “Proposed hub location”. 35 affordable family homes will be demolished to make space for this car park. Will provide 820 car parking places. This is an increase of 628 car spaces beyond that currently available at the hospital itself. There are already hundreds of spaces in five existing multi-story car parks only 5 to 15 minutes’ walk from the hospital. Some cannot use public transport or walking or cycling to visit the hospital. But of these 820 car spaces, only 34 of them are allocated for people with disabilities. The BRI authorities aim to allow 46% of staff, patients and visitors to drive into the centre of the city to attend hospital. They claim to be “in discussions” about a better bus service. But there are not even any plans – unlike their detailed proposals for car parking. They aim to provide more cycle storage – but don’t need to demolish homes and build a multi-storey car park to do this. By making it easier to park right next to the hospital they will encourage more people to drive into the city, instead of checking out the many alternatives. It is estimated that 300 people die prematurely in Bristol each year due to air pollution. These proposals will worsen air quality, congestion and road danger, and will increase the risk to people’s health, especially the young and the elderly. Bristol Cycling calls for a thorough, detailed, realistic and reliably-funded plan for fast, cheap and convenient bus travel to stand alongside attractive and secure facilities for walking and cycling. P.S. Our friends over at Bristol Traffic offer this perspective on the implications for the neighbourhood of this new car park.